Aubrey Solomon, center, who two years ago was a five-star recruit from Georgia, added to Tennessee’s recruting haul by announcing he would transfer from Michigan. He will have two years of eligibility with the Vols, but it is not yet known whether he will be available next season. The class is headlined by five-star offensive tackle Wanya Morris. The Georgia native is rated as the nation’s No. 13 overall prospect, according to the 247Sports composite rankings. Solomon is a former five-star recruit from Georgia who spent the last two seasons at Michigan. 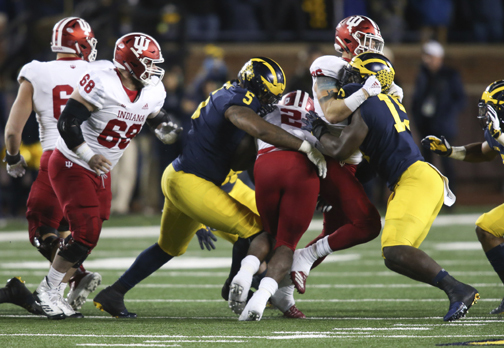 He appeared in 18 games for the Wolverines, totaling 24 tackles and two tackles for loss. Solomon was limited in game action this past season by injury. He would need a waiver to be eligible to play for the Vols in 2019. All 18 players in Tennessee’s early signing class were rated at least a three star from one of the major scouting services, with 11 earning four or more stars. Even before the National Letters of Intent began rolling into the recruiting office, Tennessee received a key commitment. Tennessee’s staff put in long hours securing the new class. Coaches made a lot of road trips and ate a lot of home-cooked meals. But Pruitt made sure to credit the current Vols for helping attract more talent to Rocky Top. Pruitt expects 12 of the signed recruits to arrive in January to get acclimated to UT, go through spring practice and try to compete for early playing time.